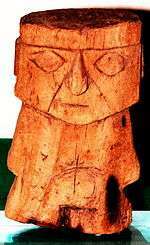 Solid clay idol called cuchimilco from the Chancay culture. 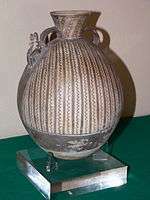 A pitcher typical to the Chancay culture. 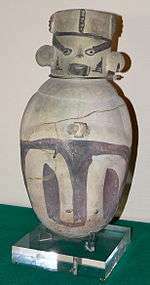 Ceramic pot from the Chancay culture. The Chancay were a pre-Columbian archeological civilization which developed between the valleys of Fortaleza, Pativilca, Supe, Huaura, Chancay, Chillón, Rimac and Lurin, on the central coast of Peru, from about CE 1000 to 1470. Not much is known about the Chancay civilization which developed in the later part of the Inca empire. This culture emerged after the fall of the Wari civilization. Parts of the southern Chancay area were conquered by the Chimú in the early fifteenth century and in about 1450 A.D. the Incas were occupying both areas. It is believed that the Chancay had a centralized political structure, forming a small regional state. Thus the Chancay culture declined in the fifteenth century to make way for the territorial expansion of the Inca Empire. Occupying the central coast coastal region of Peru, the Chancay were centered mostly in the Chancay and Chillón valleys, although they also occupied other areas such as the Rimac and Lurin valley areas. The center of the Chancay culture was located 80 kilometers north of Lima. It is a desert region but has fertile valleys bathed by rivers and is rich in resources that allowed for, among other things, extensive agricultural development. The Chancay culture based its economy on agriculture, fishing and trade. Water reservoirs and irrigation canals were built by engineers in order to develop agriculture. As the culture was geographically located on the oceanfront, they were involved in traditional fishing both from the shore as well as further out to sea from their caballitos de totora, an ancient type of watercraft unique to Peru. The Chancay also traded with other regions either by land towards the Peruvian highlands and jungle or by sea to the north and south of their borders. A straw sewing box from the Chancay culture. Sewing tools from the Chancay culture. The most well-known Chancay artefacts are the textiles which ranged from embroidered pieces, different types of fabrics decorated with paint. A variety of techniques, colours and themes were used in the making of textiles. They used an array of colours including yellows, browns, scarlet, white, blues and greens. Sling made of woolen yarn from the Chancay culture. Lock of hair covered in fabric from the Chancay culture. In type of fabric used include llama wool, cotton, chiffon and feathers. Their technique involved were decorated open weave, brocade, embroidery, and painting. 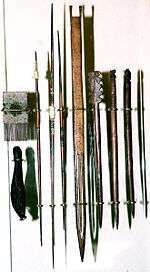 Brushes were used to paint anthropomorphic, zoomorphic, geometric and other creative designs directly on the canvases. The Chancay are known for the quality of their painted tapestries. The typically geometric designs also included drawings of plants, animals such as fish, cats, birds, monkeys and dogs (most notably the hairless Peruvian dog) as well as human figures. Birds and deities wearing crescent-like headdresses were one of the more common decorative features. They produced a variety of goods such as clothing, bags, and funeral masks. Ceramics are also a very common feature of the Chancay culture. This pottery has been found mainly in the cemeteries of the Ancon and Chancay valleys, for example at Ancon (archaeological site). The Chancay civilization produced ceramics on a large scale using moulds. However, open vessels with more than 400 different types of drawings that have yet to be decrypted, uniquely created by artisans, have been found. The wood carvings done by the Chancay are characterized by their simplicity, sobriety and use of shapes from nature, quite opposed to the sophistication of their textile art. From wood they produced implements of daily use, statues and items for decoration, some of which they painted. Using the wood from their coastal desert the Chancay carved large and small objects, finely engraved with motifs reflecting the marine environment, such as seabirds and boats. With respect to architecture, this civilization is noted for creating large urban centres with pyramid-shaped mounds and complex buildings. It was organized by different types of settlements or ayllus and controlled by leaders or curacas. The urban centres had typical constructions for civic-religious purposes which also included residential palaces. These urban centers were quite large, perhaps due to the mass production of goods. Access to the pyramids was through ramps, i.e. from top to bottom. Their hydraulic engineering works such as reservoirs and irrigation canals were also of great notoriety. Wikimedia Commons has media related to Chancay culture. 1 2 3 4 5 6 7 8 "The Chancay Culture". Retrieved 18 February 2013. 1 2 3 4 5 6 7 8 9 10 "Central Andes". Museo Chileno de Arte Precolombino. Retrieved 18 February 2013. 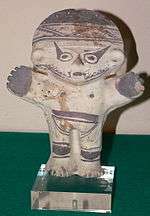 1 2 3 4 5 "Featured Artifacts: Chancay Culture, AD 1000-1400". SFU Museum of Archaeology and Ethnology. Retrieved 18 February 2013. ↑ "Perú celebra 24 años de reconocimiento mundial a perro sin pelo". El Universal. 14 June 2009. Retrieved 19 February 2013.